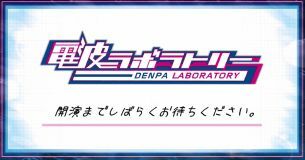 Denpa Laboratory (電波ラボラトリー) is a bi-weekly talk show hosted by seiyuu Washizaki Takeshi and anime song singer May'n. There are usually two seiyuu or singer guests per show, and each has a talk session of around 30 minutes. Some of the broadcasts were as follows.